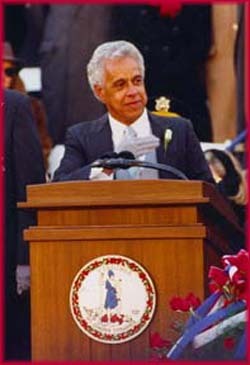 Lawrence Douglas Wilder (1931- ) was the first African American in the United States to be elected governor of a state. A veteran of the Korean War, he was a lawyer by profession, and he was the first black member of the Senate of Virginia in the twentieth century. In 1985 he was elected lieutenant governor, the first African American elected to statewide office in Virginia. Four years later he was elected governor of Virginia. Wilder's inauguration as governor in January 1990 was doubly notable in that the first woman to win election to statewide office, Mary Sue Terry, was sworn in on the same day as attorney general of Virginia. For a brief time in 1991 Wilder was a candidate for the Democratic nomination for president of the United States. His prominence in national politics, based on his achievements in Virginia politics, illustrated how much had changed in Virginia and in the nation since the days when African Americans were often prevented from voting or taking part in public life.